Ritu Jha/Rediff.com reports from California. In a significant blow to his career, Bikram Yoga founder Bikram Choudhury has been ordered by a Los Angeles jury to pay $924,554 (Rs 6.28 crore/Rs 62.8 million) as compensation to Minakshi Jafa Bodden, his former legal advisor, for wrongful termination. Choudhury is the founder and president of Bikram Choudhury Yoga Inc and Chairman and CEO of the Bikram Yoga College of India in California. A Los Angles Superior Court spokesperson said the jury awarded the damages to Bodden based on: Past lost earnings - $237,054 (Rs 1.6 crore/Rs 16 million); future lost earnings - $187,500 (Rs 1.27 crore/Rs 12.7 million); past economic loss including mental suffering and emotional distress - $50,000 (Rs 34 lakh/Rs 3.4 million); future non-economic loss including mental suffering and emotional distress - $450,000 (Rs 3.05 crore/Rs 30.5 million). "Our client is deeply appreciative of the verdict," Bodden's attorney Carla V Minnard said. 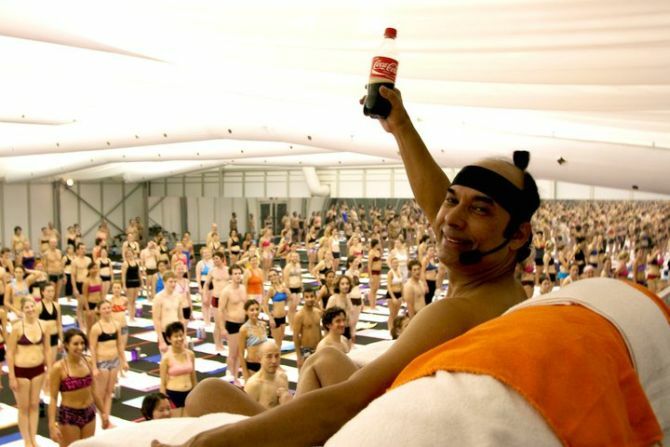 "We are most appreciative for the opportunity to bring to light in a public forum all of the conduct that Bikram Choudhury and Rajashree Choudhury (the company's vice-president and Choudhury's wife) have worked so hard to keep hidden and under wraps for many years," Minnard said. "Ms Bodden is the first person to have ever taken Choudhury to trial and we greatly admire her courage," Minnard added. "We think the verdict is a tremendous vindication of all of Ms Bodden's efforts to stop the abusive and harassing conduct not just towards herself," Minnard said, "but to numerous other women who have attempted to stand up to Bikram Choudhury." "She stood up for what was right at great personal risk to herself and her daughter, both of whom were threatened by Bikram Choudhury with being deported and killed," Minnard alleged. "We look forward to the punitive damages phase of the trial, and to the award of attorney's fees in this matter which will be awarded by Judge Mark Mooney," she said. Bodden filed the case on June 11, 2013, in which she alleged discrimination, retaliation and harassment by Choudhury. According to the court document, Choudhury failed to pay Bidden the salary promised her. Choudhury, Bodden complained, repeatedly used obscene language, repeatedly made offensive and vulgar sexual gestures, and made disparaging remarks against single mothers, including herself. Choudhury, the court document alleged, created a hyper-sexualised, offensive and degrading environment for women. Lady staffers were required to give him massages, and Bodden had to conduct business meetings while he was receiving a massage. Bodden and other lady staffers were summoned to Choudhury's hotel room at night for meetings, the complaint stated. Not only Choudhury, the complaint alleged, but Choudhury's friends from overseas would treat women as if they were chattel, meant for sexual pleasure. Bodden tried many times to investigate the mistreatment of lady students, but was asked by Choudhury to stay away. She alleged that Rajshree Choudhury, who is also founder of the USA Yoga Federation, was aware of her husband's behaviour, but did nothing to prevent or curtail it. Instead, Rajshree Choudhury, Bodden alleged, defended her husband and told Bodden that 'Bikram was saying you are having an affair' with an attorney she had retained. Choudhury, the court document stated, threatened to put Bodden in jail on several occasions. On March 2013, Bodden was forced to resign, evicted from her home, her car repossessed and the process to secure a Green Card revoked. What is the right way to do pranayama? 5 yoga poses for a great start to your morning!